Our Punter of the Week, from Queensland, landed a bet at odds of almost 600/1! Our Punter of the Week, from WA, landed the quadrella at Ascot on Saturday afternoon. Our Punter of the Week, from Darwin, walked away more than $1,000 richer as a result of a dead-heat. Our Punter of the Week is SS, from Victoria, who walked away more than $6,000 richer after landing a cross-state gallops treble on Monday afternoon. Our Punter of the Week is LD, from Sydney, who won in excess of $5,000 after landing a Top Fluc treble at Saturday’s Rosehill Gardens meeting. 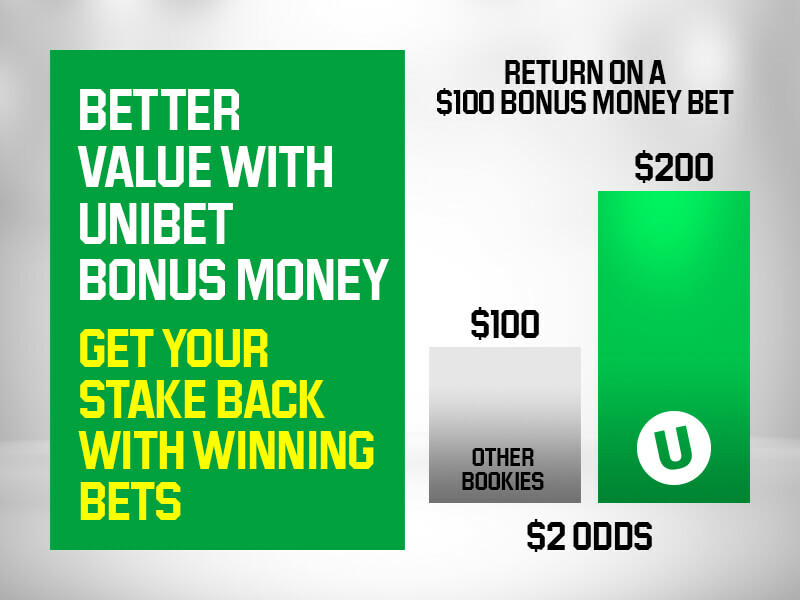 One Unibet punter had a Sunday afternoon to remember after winning more than $40,000 with a successful exotic bet in the third race at Moruya. Our Punter of the Week, from Melbourne, landed a simple race-to-race treble on Saturday afternoon. Our Punter of the Week is ES, from Sydney, who turned a minimal outlay into a sizeable return after placing a winning exotic on the Spring Stakes at Newcastle on Friday. Our Punter of the Week is WE, from Umina, who turned a lobster ($20 note) into $2,000 after striking a winning treble to kick start Saturday’s Randwick meeting. Our Punter of the Week, from WA, converted a 10-leg multi in a single NFL round! Our Punter of the Week landed the quadrella at Doomben on Saturday afternoon. Our Punter of the Week won after finding the winner of the penultimate race at Richmond Dogs. Our Punter of the Week took a striking successful multi on the final three races at Rosehill Gardens. Our Punter of the Week has been waiting 4 months for his 12-leg multi to settle... worth it! Our Punter of the Week turned a $300 investment into a $6300 collect after landing the quadrella at Kembla Grange. Our Punter of the Week combined 4 sports in his 12-leg multi and collect an amazing return! Our Punter of the Week from Queensland turned a $1,200 outlay into a $50,000 return with some shrewd combinations on Saturday afternoon. This weekend, punter G.B. from Western Australia celebrated a winning bet slip worth $17,399.10 from a $50 stake. With his expertise he pulled off a 7-leg multi bet based on full time results in English football. Last week Unibet punter S.M. proved that a good multi bet doesn't have to consist of Match bets only. In fact, S.M. put together a great 12-leg multi with nothing but Over 2.5 goals in the Total Goals market with European football. Total odds: $9,749! Although Hillary Clinton remained top favourite from the start to become the next US President, backers of outsider Donald Trump were rewarded generously for their bold decision to bet against the odds. One Unibet punter in particular benefited greatly from Trump's win on Wednesday, taking home no less than $164,485.